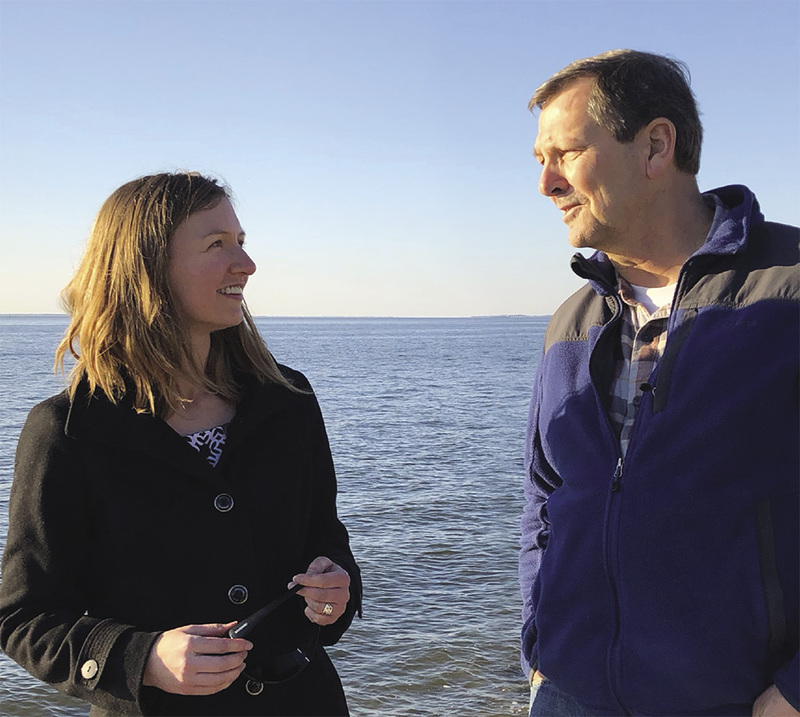 As an environmental anthropologist at the University of Maryland, Michael Paolisso had studied the effects of climate change and sea level rise on the Eastern Shore. And he knew how communities prone to flooding, erosion, and land subsidence were struggling. But as a part-time resident of Deal Island, all he had to do was take a short walk around his neighborhood to see proof that these things were happening. Along the rural Somerset County peninsula, which includes about 1,000 people across four towns, water pooled on roadways and around houses, wetland plants were overtaking yards, and high ground was becoming marsh. With no mayor or central island government, residents were left to their own devices to address these challenges. Understanding that Deal Islanders would be more resilient if they had greater engagement with decision makers and researchers, Paolisso helped form the Deal Island Peninsula Project. The initiative uses collaborative learning to build a social network linking community residents, University of Maryland scientists, and state and county officials. Collaborative learning is essentially a process that brings together stakeholders who don’t always connect so they can learn from each other. The Peninsula Project influenced the Maryland Department of Natural Resources to bring a shoreline and dune project to Deal Island to stabilize the land and prevent further erosion. The shoreline initiative is also helping the island connect with county and state officials who can assist with ditch management issues to prevent flooding. Encouraged by the progress with the Deal Island Peninsula Project, Paolisso and colleagues sought to expand the work to other coastal communities in similar straits. They weren’t hard to find. Nationwide, coastal shoreline counties include 10 percent of the land but are home to 39 percent of the population. Coastal rural lands are home to 9.5 million people, and the Eastern Shore’s population is close to 500,000; many of those are in unincorporated parts of counties. The communities may be small and lack a strong local government to advocate for help, according to the Third National Climate Assessment of the U.S. Global Change Research Program. The federal government, through NOAA and EPA, provides about $300,000 annually to the state to help communities with climate adaptation, but the money can only go to an incorporated entity, such as a county or town. Funds are awarded largely to put in place different processes for resilience, including mapping, modifying codes and ordinances, or supporting outreach efforts. Additionally, Governor Larry Hogan has pledged $15 million for resilience planning to Maryland communities over five years — but those funds require legislative approval every year. Two years in, the state has supported about a dozen projects, most of them involving installation of living shorelines, including the one on Deal Island. Unlike federal grants, the state monies can go to nonprofit organizations, which, in turn, can consider projects that protect whole neighborhoods instead of one house at a time. Officials acknowledge that it’s not always easy for small communities without mayors to know where the money is or how to apply for it. But these communities do have important local institutions that can help connect them: their churches. Paolisso’s research and life experience on Deal Island suggested the churches were central to how Shore communities operate. Often, pastors are more than spiritual advisors; they are emergency contacts and disaster response crews, food pantries, and shelters. They support their communities in times of need but also are essential conduits for information sharing in areas where internet connections are spotty. Paolisso and his colleagues wondered if the churches could fill the resilience gap. Last year, Paolisso and his team received a grant from the National Oceanic and Atmospheric Administration’s Coastal and Ocean Climate Applications program for their project, “Linking Rural Decision Makers with Local Churches to Build Coastal Resilience to a Changing Climate.” Maryland Sea Grant is a partner on the project, which Paolisso heads, along with anthropologists Christy Miller Hesed, project director, and Elizabeth Van Dolah, a postdoctoral researcher. A collaborative learning approach is more than just bringing people together. It entails inviting residents of local communities into complex discussions about scientific concepts and demonstrating to them how different predictions of sea level rise may affect their landscapes and their lives. It involves bringing in experts from state and federal agencies to explain how they award grants for adaptation projects, what projects are eligible, and how to apply for funding. And it requires the commitment by community members to attend follow-up meetings with Paolisso’s team over months — or years. But for those who put in the effort, the process can empower communities to open channels of communication with scientists, government officials, and nonprofit agencies. If people know what to ask for and how to ask, they may get money for hazard mitigation plans, projects in the ground, and technical design advice. Drawing on previous anthropological research that Paolisso, Miller Hesed, Van Dolah, and others have conducted on socioecological change, the project seeks to answer these questions: Can rural churches help to link county and state decision makers with rural communities? Is a collaborative learning approach effective in bringing together church leaders, local decision makers, and citizens to become more resilient? Will it help residents understand the challenges of climate change, the scientific underpinnings of the flooding and erosion they’re seeing, and bring them closer to a community solution? Participants include members of 12 churches, all but one of them Methodist; representatives from Wicomico Interfaith Partners; and elected officials and staff from Dorchester, Somerset, and Wicomico counties. Paolisso and his colleagues have been meeting with these individuals over the past year to discuss their needs and determine how improved collaboration between churches and decision makers can help. At these meetings, scientists present concepts, maps, plans, and other aspects of sea level rise, climate change, and adaptation, with their messages tailored to a general audience. Participants receive information that is more substantive than what the local newspaper might publish and more accessible than scientific papers posted online. They are encouraged to provide feedback based on their own ideas of what’s worked in the past. Part of the project involves assessing what residents believe, where their information comes from, and how much faith they put in the science of what is happening on the ground. Interviews indicate that some participants understand the science underlying the changes and wish to learn more. Others maintain that the problem stems from erosion that has always battered the shorelines of these low-lying, marshy communities. Regardless of their beliefs, the residents often agree on solutions: finding funds to raise houses or neighborhoods, building protections, and maintaining the road network. Research wraps up next year, with a report and a film to be presented by mid-2019. At that time, project leaders will have a sense of how much the collaborative process helped the community to understand, prepare, and adapt for its changing future. 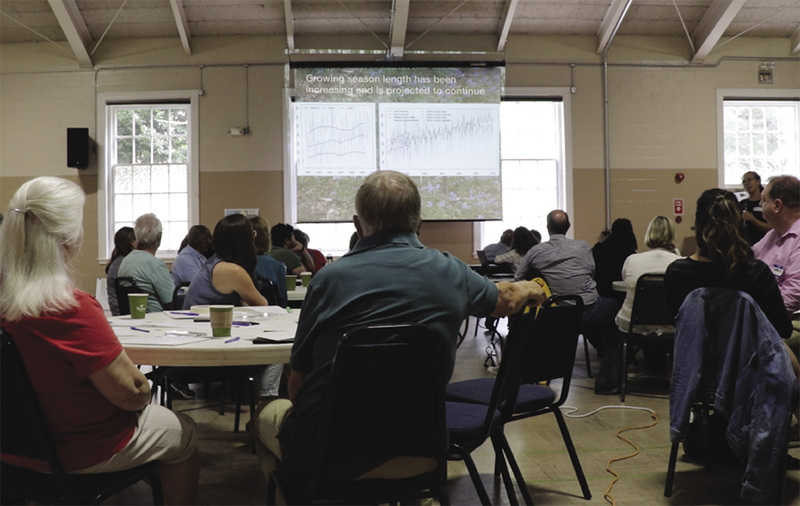 At a meeting in August in Dorchester County, anthropologist Christy Miller Hesed led a discussion between officials — county emergency manager Anna Sierra and environmental planner Brian Soper — and congregants at New Revived United Methodist Church in Smithville about a problem: A marsh is encroaching on the church property. Water from the marsh threatens the church’s cemetery. And the intruding water makes it impossible to dig graves during certain times of the year. It was an opportunity to put the collaborative learning approach into action. 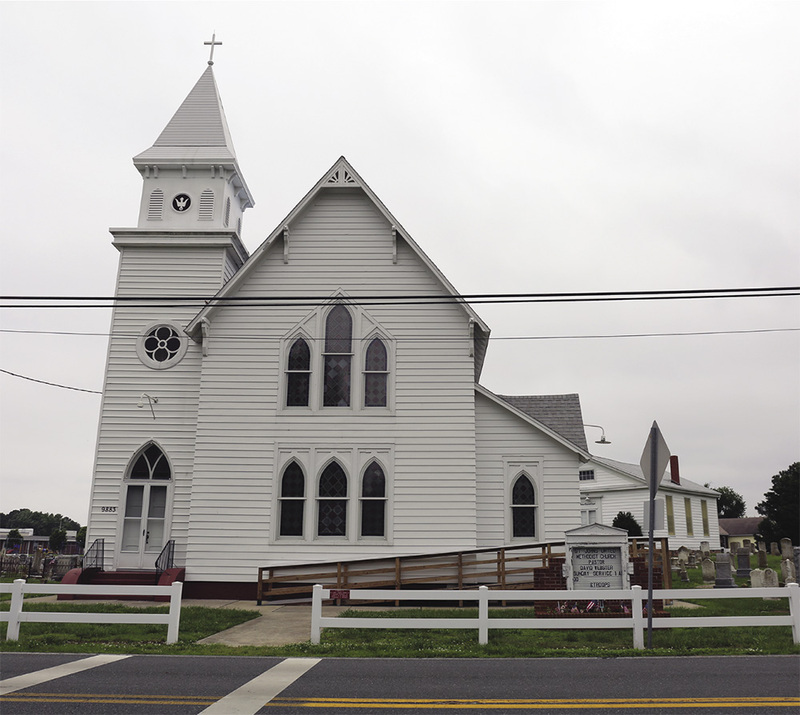 Parishioners are mostly senior citizens in an African American community, where residents say many families are related and trace their history to the 1800s. They worry the marsh waters could flood their church. New Revived, which dates to 1925, is still intact, structurally, despite a partial flood during Tropical Storm Isabel. Soper and Sierra reminded the group that the county can’t offer money — only technical solutions and assistance to get permits approved. She added that whatever solution they choose, they have to be mindful that the past is not a guide for the future. County public works director Ryan White said his neighbors tell him, “It rains differently now.” That rain, more frequent and heavy, brings more flooding to an already soggy peninsula. “We are living climate change. We are living land subsidence. We are living vulnerability right now. Other counties have 20, 50, 100 years to plan for it — we’re living it right now,” Sierra added. The goal at the Dorchester meeting was not to make a final decision but to examine and discuss options. Victoria Chanse, an associate professor of landscape and plant science at the University of Maryland and part of the collaborative team, presented design ideas for mitigating the marsh migration now and the effects of heavy rain in the future. Joan Brooks, pastor of New Revived, said that whatever plan they choose, she’d need help implementing it. Sierra and Soper and other county officials responded that they would try to mobilize assistance. After several hours, the group reached no conclusions about whether to build a berm or opt for a living shoreline approach. But many participants agreed it was valuable nonetheless. A few said that, while they’d met county officials years ago through a citizens’ erosion group, they hadn’t had an opportunity to connect in a direct way before these collaborations. They worried about their future and wanted to examine solutions. They understand the changing climate will bring more frequent flooding, and they want to be able to save what’s special about their communities. “Often, we feel like we’re on the fringes, we’re not part of things. But they brought us in, and it has been enlightening,” said Roslyn Watts, a pastor and Dorchester resident who worries about flooding at Church Creek, where she lives, as well as at New Revived.